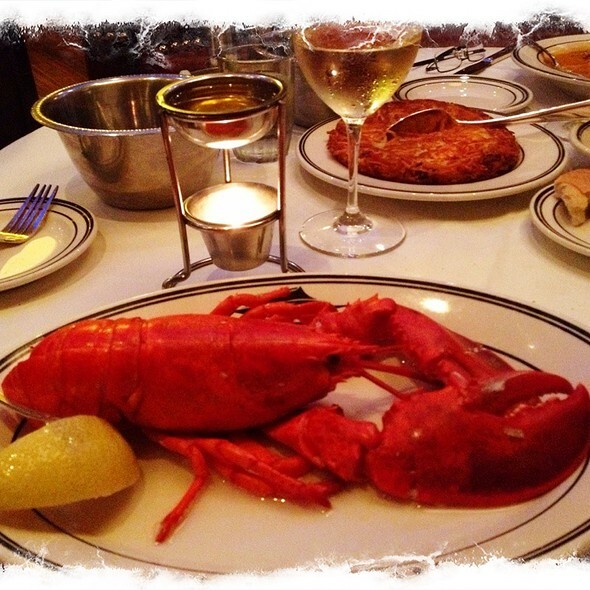 You must make reservations at least 5 minutes in advance of the time at Oceanaire Seafood Room - Atlanta. $5 Valet parking available evenings 7 days a week. Street parking is available on side streets however, Oceanaire can not guarantee street parking. We are located between the Midtown & Arts Center MARTA Train Stations. MARTA Bus line has multiple stops along our block of Peachtree Street. 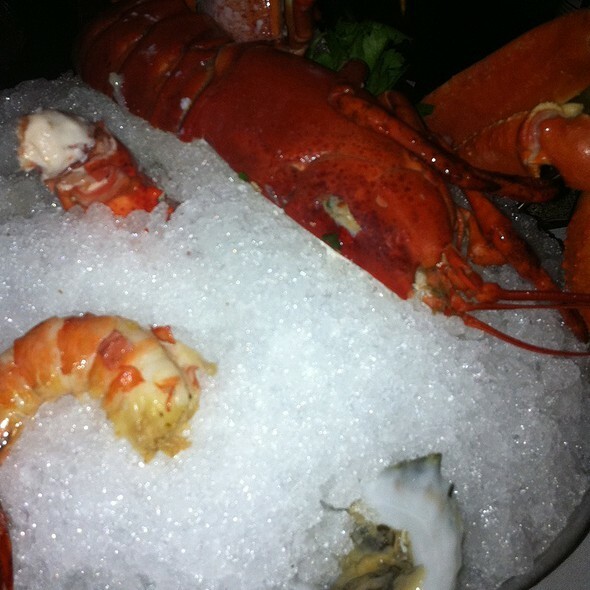 The Oceanaire provides the perfect setting to enjoy Ultra-Fresh seafood, flown in daily from around the world. Sip a cocktail in the lounge, take a seat at our grand oyster bar, or kick back in a horseshoe booth before diving into a sea of Ultra-Fresh fish, including steak-cut Alaskan Halibut, seasonal favorites like fresh Copper River Salmon or hard-to-find delicacies like true Dover sole or Bluefin Tuna. Our daily-printed menu will guide you, a wine list as deep as the sea will seduce you, and the world's freshest seafood awaits you at The Oceanaire. We celebrated Easter. Had a very nice dinner and enjoyed the experience. We will come again. Such a great atmosphere; too bad the food and service are not good. I ordered the halibut, and I should have asked more questions about it before selecting it. I could not believe when I was served a fried halibut dish. Who does that! Such a great tasting fish ruined by heavy frying with a heavy coating. I could only taste the breading and could not taste the fish. In general, the chef 'over-does' the fish and it comes more about his preparation and nothing about the fish. Tame it down big time! The service was both very slow except for people either coming to ask us how things were going.....interrupted our conservation for no good reason. I would rather have good service than manager check ins! Portion size is spot on. Steak was not hot but had great flavors. The crab mashed potatoes is amazing and most of the sides are full of flavor. Crab cakes could use a little seasoning. Only down side, was being charge $2 per item for extra seasoning on the lobster and salmon. Seriously... a couple of more sprinkles cost nothing. Food was good! Service was excellent! The service was very bad 3 1/2 hours later we finally were able to leave the restaurant. The manager CHARLES I believe was his name was on staff and not helpful. One of the worst birthday experiences for dinner that I can recall in Atlanta. I didn’t eat much because in my hunger, I regretfully and mistakenly filled up on bread so my experience is through my mothers eyes. She enjoyed all her food except the grilled lobster. But that was because she discovered she preferred broiled lobster. No mark on the chef just her preference. Overall a very attentive wonderful dinner. Only one caveat a woman whose title I’m unsure of kindly greeted us and escorted us out. I assume she was a manager maybe? A hostess? We weren’t sure. It would have been nice if she explained who she was. Otherwise everything was perfect and I’m glad I was able to treat my mom. In the early afternoon I went on line to try to book a table for that evening for 7:30. It showed first availability was 8:30 so I booked that although that is later that I like to dine. At about 5:00 I called the restaurant to ask if there was any chance I could be squeezed in earlier. She told me that the restaurant was wide open that evening so, yes, I could come earlier. When I arrived at 7:30, I would estimate that only about 1/3 of the tables were occupied. I mentioned this to the manager who said he would look into it. As for the service, I had barely finished my starter when my main course arrived. Too fast. We have eaten in some very good restaurants on both coasts and in Europe. However, my Significant Other and I agreed that Oceanaire provided us with likely the best seafood and dining experience we have had in a long time. Maybe ever. 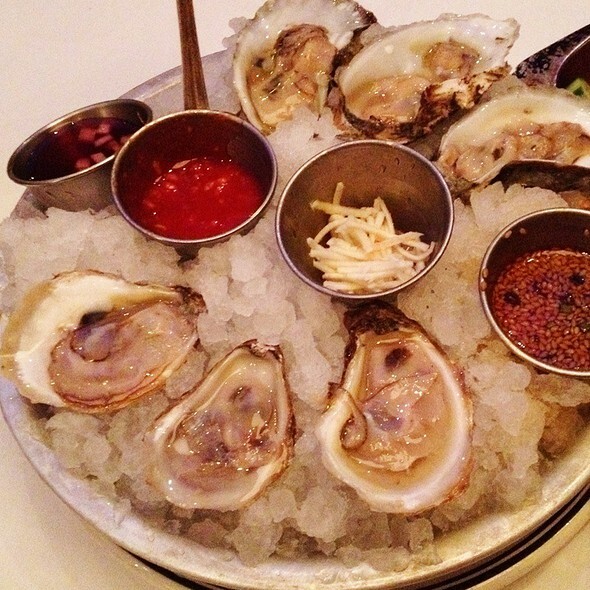 The freshest seafood prepared with care and simple additions that accentuated each dish. We started out with a normally simple fried calimari - only the chef had accentuated it with unusual items like fried lemon! Very fresh calamari - wonderful. We both like crab and decided to share two specials recommended by the waiter - Avi (who was great): an Alaskan halibut and two crab cakes. Both perfectly prepared and both absolutely fresh. With a perfect remoulade on the side for the crab. Almost as an after-thought, we ordered a side of collards. These are not your grandmother's collards; these were the best collard greens we had ever had with lean bacon accents and they had a balsamic vinegarette reduction in them making them most delicious and a good compliment. 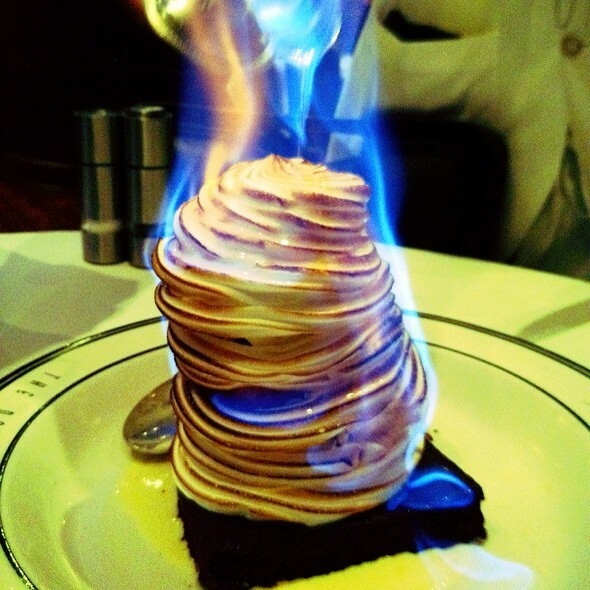 And their Baked Alaska is to die for. Service was excellent - with great coordination between the main waiter, and all the table support staff. The manager even stopped by to inquire if everything was satisfactory. Actually the best table service in my memory. Also, the atmosphere and interior design were also terrific - with booths being circular and yet open enough to observe the room if you wished. Understated and casually elegant. I read where someone wrote that the prices were high. Yes, it costs a lot to fly fresh fish in from around th world. The Alaskan halibut we had was probably swimming off the coast of Alaska less than 48 hours earlier. There is a cost to that - and the difference between frozen anything and halibut is tremendous. 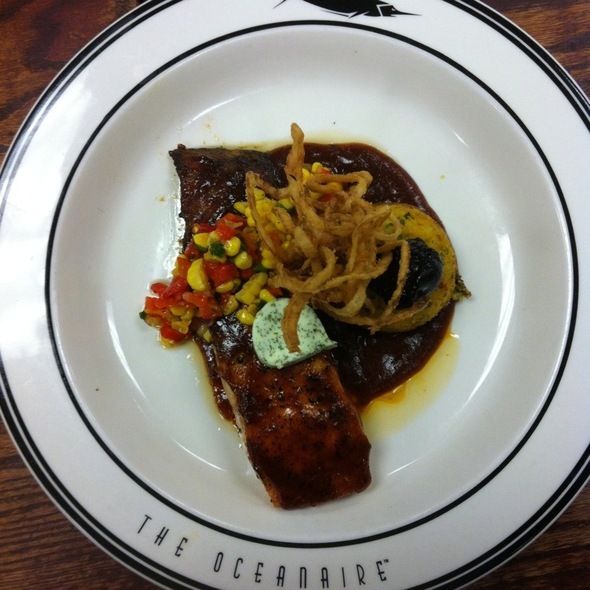 In short, Oceanaire is a special occasion restaurant for us and we will be returning. Always excellent food. Our server Aaron was very helpful and interacting with him was a highlight of the meal. My first time coming here and I feel that my service was overall bad. My server was rushing me and my party to put our orders in before we could even come to a decision on what we would like to eat. He even kept telling us that certain items would be a different price every time we wanted to add on or change something. I don’t know if he thought we didn’t have the money to purchase the dish we inquired about or whatever but felt as if he thought we wasn’t able to pay for it. My mom had ordered a salmon with grits and she didn’t like her salmon at all. She informed them on it and they asked her will she like to pay for an additional dish, as well as the dish she had ordered already. I would never refer anyone to this place this will be my first and last time ever coming here. This is the second time in recent months that I have had the opportunity to dine at Oceanaire Seafood Room. Like the first time, I was impressed with the entire experience. The hostess warmly greeted me, directed me to my table and ensured I was satisfied with the location. The designated server was Crystal and she was superb!! From the time I arrived at my table to my departure she was courteous, attentive and well informed about the menu. 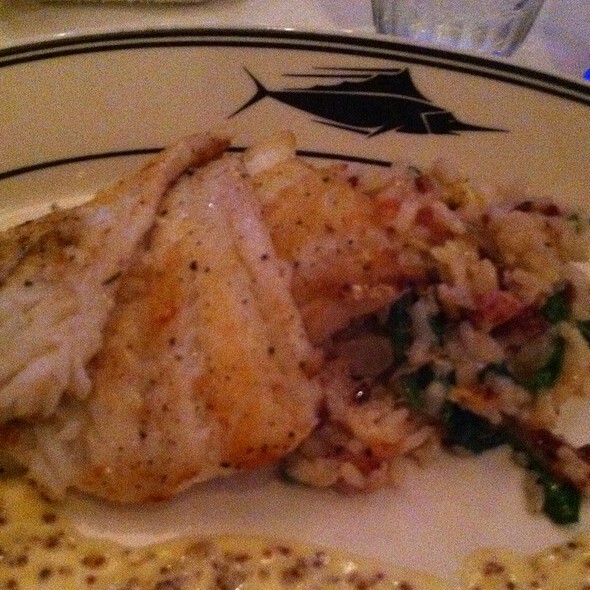 In fact, her suggestion that I select the halibut made the entire meal a culinary delight. 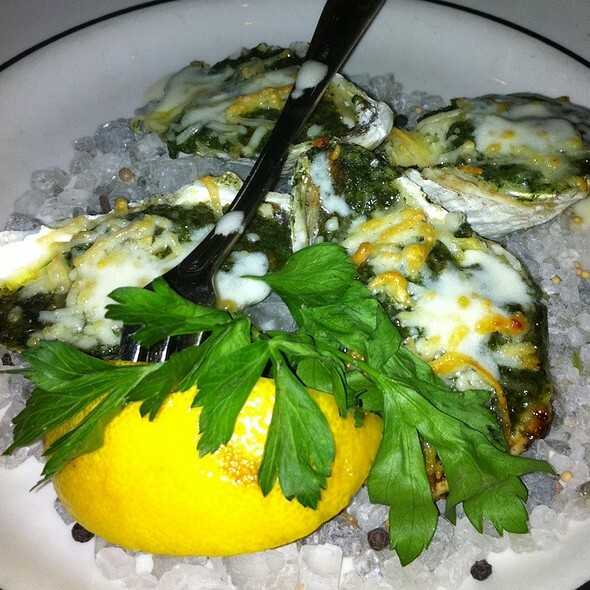 I will continue to dine at Oceanaire whenever I am in Midtown and especially when I attend a performance at the Alliance Theater. EVERYTHING WAS SIMPLY PERFECT. WE WILL COME AGAIN AND ENCOURAGE FRIENDS TO DO THE SAME. The food was excellent.... service was great. I appreciated the birthday greeting from almost all the staff. The drinks were top notch ... we had a few. I had the sea bass- melt in your mouth !! Truffle whipped potatoes and broccolini , great side choices. Choosing Oceanaire Seafood Room to celebrate our son's birthday was a hit. The food, service, and atmosphere was spot on. We couldn't have made a better choice. Looking forward to dining there again. Our dining assistant was wonderful! I've been to Oceanaire quite a bit of times and the food and service is always great, but the service we got on our last visit was top notch. Our waiter Avi was OUTSTANDING! He made us feel like we were the only table he was serving. Very attentive always making sure we had what we needed while having someone shadow him, and taking care of another two large group. For a Monday it was a bit busier and louder than I expected. But we had a great night thanks to our waiter. When you spend this type of money on food great food and service is what you expect and that's what we got! Best place in Midtown for great Seafood and service!!!!! Delicious food and great service, but the prices are high for the portions. Not so great food but ambiance and seating fantastic! Will definitely look to have my birthday celebration there. The food and service were great. The restaurant is beautiful. On balance, the prices seem a bit high and their corkage fee is RIDICULOUS. Amazing food, amazing service, wonderful time! I researched this restaurant before making a reservation for our vacation in Atlanta. I read the reviews noting the price was not justified and I do have to agree. The restaurant was clean, great service...everything else you would expect from an upscale restaurant, however the prices were crazy!! We had an appetizer each, two drinks, main meals, and one dessert and our bill came to almost $200 for the two of us. This is not counting in the $50 tip I left our server. There were lots of other amazing choices in the area and if we were ever to return I would definitely pick another place to dine. The food was underwhelming for the price. Interior seems a little dated. The service was extremely slow and inattentive. Oceanaire was amazing at providing great service for a prom dinner for 12. Would highly recommend this restaurant to others. My recent experience was great although was suprised the prices were 20-25% higher. It defenitley will affect my decision when to eat there again. Lobster and mac/cheese was skimpy on the ingredients and over zealous on the bread. The other meals looked good. The restaurant is very pretty our server was lovely the food was good BUT we were so rushed for no reason. Management and staff were cordial and courteous. Our waitress Brittany was outstanding. To start the drinks came out wrong for both of us. Then when the food was delivered the waitress said the chef wanted to fix hers another way than what she asked and she went for it. Who does that? She actually thought my wife was going to buy that. It was a Birthday dinner out of town and a complete disaster. Ended up going across the street to STK which I would highly recommend. Fine services with good food. Just price level should get more value. From the moment we entered the restaurant we were greeted with very friendly and professional staff. We were there to celebrate a birthday and they made it a joyous occasion. The menu was personalized with a birthday message that they saved and gave to us as a keepsake item at the conclusion of our meal. The GM came to our table to personally ask about our experience and extend birthday greetings. The chef prepared a special “birthday” appetizer which was delicious. Everything was cooked to perfection. From the appetizer and salad to the main entree and dessert (wonderful birthday dessert) the food was amazing! Our server was very attentive, made great suggestions and made our evening truly enjoyable. We would highly recommend this restaurant!